Peter Layne takes a nostalgic journey through Pionair Adventures' life starting with Grumman Ag-Cat ZK-Mew in 1991 through to operations in three countries in 2004. ZK-CMM, a Miles Messenger 2A in pristine condition, is a recent addition to New Zealand's treasure-trove of historically valuable warbird aircraft. Almost forgotten by many, this extremely rare aircraft never gained the reputation its exceptional performance warranted. Rob Neil talks to owner David Cowie about Miles aircraft in general, and his outstanding Messenger in particular. New Zealand's face is often best revealed to the world's travellers by the many ""flightseeing"" operations based in and around the country's scenic highlights. One such operation is Wanaka Flightseeing, whose flight operations manager, Andy Woods, talked to Rob Neil about flying in this southern alpine paradise. 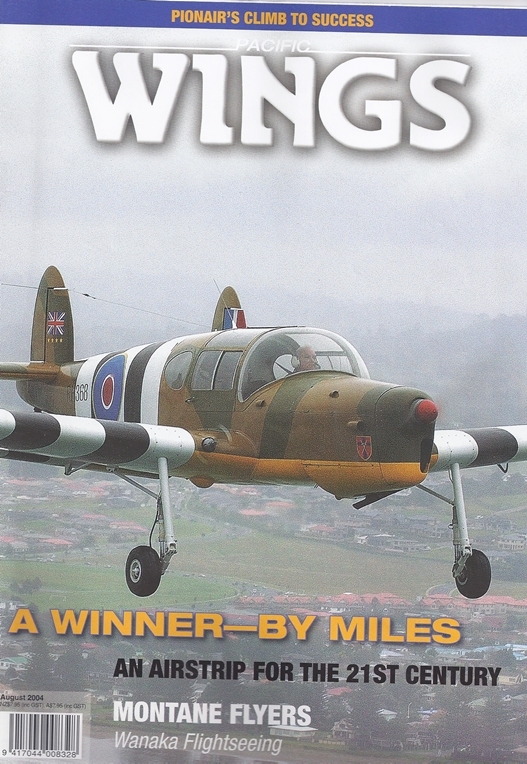 By Wing Commander Geoffrey Morley-Mower (RAF, Ret. ), DFC, AFC. Once in a while a sort of miracle occurs - a government agency takes an initiative that is actually really useful, is needed, and is well received by the people most involved and affected. Such is the case of the recent changes to the Health and Safety in Employment Act concerning agricultural aviation. Mike Feeney takes a look at a shining example of a new farm airstrip that will keep agricultural operators, famers, and OSH inspectors smiling.